Berlin-based Australian band Parcels are back with an irresistible new single TIEDUPRIGHTNOW, out now on Kitsuné / Because Music. This is Parcels’ most instantly infectious cut to date, mixing crate-digging disco grooves, a taut indie sensibility and effortlessly uplifting harmonies into immaculate modern pop. Loving it! Watch the Beatrice Pegard-directed visuals below! We recorded Tieduprightnow in a Berlin studio, we had just lived out 6 months of German winter without even a hint of sun. But during this session it was the start of spring and the first rays began to peak through our window. The video is a homage to our roots. We all liked the idea of playing with the Australian stereotype, how the world views Australia and how we fit into that. We drive through our original hometown Byron Bay, the quintessential Australian surf paradise, and observe what it means to be Australian.“ Director Beatrice Pegard also comments on the video: “Northern NSW and Byron Bay are coastal areas that are currently being destroyed by profit-motivated policies and lobbies, and where marine life and ecosystems are disappearing at an alarming rate. The Australian lifestyle as we know it, the joys of summer, of surfing and living by the beach would not be much without its marine ecosystem and wildlife. Already building a truly global, musically-diverse audience, Parcels are still-just-20-year-olds Louie Swain (keyboards), Patrick Hetherington (keyboards), Noah Hill (bass), Anataole Serret (percussion) and Jules Crommelin (guitar). Three years ago, the Byron Bay schoolmates made the big leap of moving to Berlin, finding in one Europe’s most creative cities the prospects that equalled their ambition. 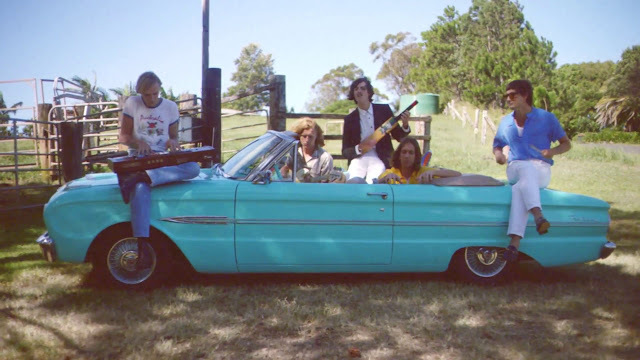 Parcels’ early sound suitably reflects this ability to travel, and transform yourself: following an eclectic thread from The Beach Boys and Chic through to yacht rock heroes like Steely Dan and local heroes Tame Impala, all the while blending elements of electronica, funk, yacht rock and tirelessly-drilled live musicianship into classic but contemporary pop. It’s in their Berlin exile – and its long history of creative breakthroughs – that the alchemy which makes Parcels so refreshing first crystallised. Theirs is a maniacal taste for perfection when it comes to production, composition and arrangement, with a live show so accomplished that Daft Punk offered to work with them on the spot (the first time the duo have chosen an emerging act to add to their list of collaborators, which also includes the likes of Kanye, The Weeknd and Pharrell).